Happy anniversary…to me!! I opened my Etsy shop 1 year ago & though I’m usually terrible with birthdays & anniversaries, this is one that’s so special to me that I definitely want to celebrate. Hurrah! It’s easy to get caught up with the day to day craziness that goes along with running an online business & forget to take a moment to celebrate our little milestones. Being self-employed it’s often easy to let those things slide; we don’t get performance reviews or raises. There are so many little milestones that I want to record & celebrate – selling my first painting, my first craft market, my first gallery show. Sure, there are still a ton of things I want to add or fix or spruce up in my shop (I’m talking to you, badly-lit photos! ), but I couldn’t be happier with how my artwork has been received in general & all of the truly kind people I’ve met since I dared to dip my toe in the waters of the art world. So it’s time to throw my own anniversary party! Care to join me? There are goodies! And secondly, a giveaway! Just leave a comment on this post to enter & next week I’ll randomly pick a lucky commenter to receive a package of 4 of my blank postcards. Your postcard pack will arrive with 4 notecards (sized 4″ X 6″) plus 4 brown bag envelopes made of 100% recycled material that are lovely to the touch, all sealed up in a rainproof cello sleeve. I use them all the time for little notes & thank yous. While I’ll certainly count your entry with any old comment, I would love if you could tell me something that *you* love. A great new book you’ve read, a movie recommendation, another artist you think I’d like – anything that spreads the anniversary love. Thank you all for a very good year and, of course, good luck! 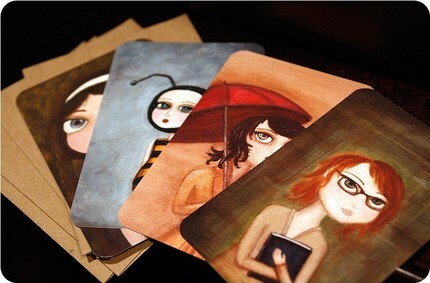 i bought your postcard pack for my sister at the etsy spring sale…we all love them! Congrats! I love your paintings. My best tip would be to watch Glee. It’s great! I’ve just found your shop, and I’m glad I did 🙂 Really beautiful work, congratulations! Congratulations on your first Etsy-versary. I highly recommend the movie, Sunshine Cleaning. I recently saw it and enjoyed it very much. “Comment” … now where is the free stuff ??? Happy Anniversary! This is so cool, I love your artwork. It was nice bumping into you at craft fairs, keep up the awesome creativity! Happy Anniversary to my Dear Uber-Talented Friend. Something I love…Vancouver, any ocean and You! I need some gifts for boys though! Congratulations on your anniversary! I actually thought you were here much longer as you’ve established your identity on Etsy quite well! Great job! Let’s see.. have you heard of Tina Tarnoff? I just bought some of her work from her etsy shop (http://www.etsy.com/shop.php?user_id=5458335&section_id=5468481) and I am blown away by her talent! One of my favorite things to do is read an old favorite…one is The Probable Future by Alice Hoffman. Oh, and I LOVE your art! Love your work. Congrats on the etsyversary! I just saw the new Matt Damon movie, The Informant. and loved it! Very clever! I like coffee. I especially like coffee with you. Maybe a walk. With dogs. Hi Kris! Congrats on your Etsyversary! Something I love is my husband and time off (something I rarely get)! I wanted to stop by your blog and most importantly wish you a happy anniversary! Congrats on one year of selling! Something I love? It’s great to see people happy, making and selling things! Also, currently addicted to Mad Men. Happy Anniversary! You create wonderful things. Thing I love…the book the Time Travelers Wife. I don’t want to see the movie because I liked the book so much that I think the movie would ruin it for me.